Lighting management is becoming more important with advancements in technology. Many businesses are now making use of intelligent lighting control systems that automatically adjust to suit natural light levels. This allows for a significant amount of energy saving. In addition among many other benefits, occupancy control provides for automated lights on, off and dimming when the room is either entered or vacated. A DALI network consists of a controller and one or more lighting devices (e.g., electrical ballast and dimmer) that have DALI interfaces. The controller can monitor and control each light by means of a bi-directional data exchange. The DALI protocol permits devices to be individually addressed and it also incorporates Group and Scene broadcast messages to simultaneously address multiple devices (e.g., “Group 1 goto 100%” or “Recall Scene 1”). 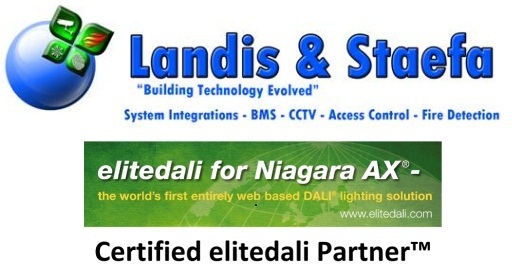 elitedali™ for Niagara AX® offers all the functionality necessary to allow commissioning, control, management and monitoring of intelligent DALI® lighting networks from a centralized Building Management System or platform. Remote control, management and monitoring of the DALI Lighting Network can also be achieved through the HTML Web environment (e.g. using Internet Explorer, Google Chrome or Firefox) of Tridium’s Niagara AX Framework. elitedali™ for Clients and elitedali for SIs and M&Es – Enable existing or planned intelligent lighting systems to readily meet the demands for accessible, open, flexible lighting control that seamlessly integrates with all existing and future building services and business systems.